We’ve all be riding or driving on the freeway when we see them. 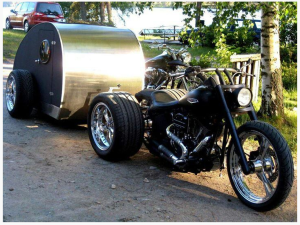 A big touring motorcycle towing a trailer behind it. Sometimes the trailer will have 2 wheels, sometimes it’ll be balancing on one. It’s definitely something that sticks with you. Who knew that motorcycles could pull trailers? Motorcycle Trailers have many different uses. Most of the time it’s for those occasions when you need to travel cross country with added luggage space. Other times, it can double as a camper for you to sleep inside. Lets be honest, Saddlebags and sissy bar bags aren’t for everyone. Let’s face it. We’ve all seen a bike that was so tacky or mismatched, we felt embarrassed for the owner. We know that sometimes motorcycle luggage might not ‘look’ right on your bike, and you don’t want to permanently install anything that’s not needed all the time. Trailers are a great substitute, easy to attach when you need it. Specific needs for motorcycle trailers are things like motorcycle camping, long distance trips and daily uses. There are multiple types of different motorcycle trailers available, open or closed, campers, 2 wheel or single wheel configuration. There’s nothing quite like the joy of riding a motorcycle. The feelings of completely freedom as you feel the wind blowing against your back. It’s only sensible that you travel and enjoy the country with the freedom of a bike but enjoy the conveniences associated with RVs. 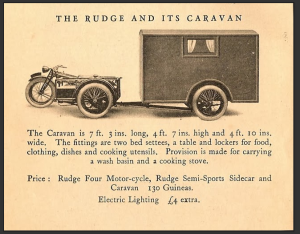 Motorcycle Trailers has been around for years, it’s a very popular hobby for those with touring bikes. Forget getting bogged down by ugly and sagging saddlebags. Depending on the type of trailer that you choose, you can also tow it behind your ATV, car or just stick to your bike. Soak up the sun and knock down the miles. Stay on two wheels while seeing the continental US. Since you’ll have a trailer being towed, you won’t need to overload the bike. Another plus side is that you get a passenger to share the moments with you, especially since riding alone is notable more boring. Camping is one of America’s classic pastimes. intend on camping inside or outside your trailer, it’s always nice to have options to choose from. Plan a trip to Alaska, Explore the Grand Canyon, or the Utah Zion national park to appreciate the earth’s natural beauty. Additionally, your trailer can even have electrical hook ups and/or other luxuries that can make camping more tolerable. More and more people are starting to appreciate and slowly transition to motorcycle trailers. As more people understand the practical uses of a trailer for their two wheel motorcycle, you’ll start to notice them everywhere. Regardless of if you ride a sport bike or cruiser bike, there are endless trailer options available. You can bring spare parts with you and all of the needed supplies. Forget compromise, you can bring everything you think that you need spare parts, spare tire, extra gas, camping gear, cold weather gear and other necessities that you may want on your trip. You don’t need to go on a trip to use your trailer. You can grab groceries, go on picnics, and go shopping for daily use of your trailer. Even use your trailer to take your surfboard to the beach. Keep parts and extra things to ensure your trips go smoothly by keeping essential parts handy in case you need to change a tire or even patch it. The beauty of it all is almost any bike can be fitted to tow a trailer. Sure there are exceptions to this rule; you don’t want to use an underpowered bike to tow a fully loaded 300lb trailer, but that’s common sense. In case you need any further justification for a motorcycle trailer purchase, think of man’s best friend, the dog. Sure, this is an unconventional use of your motorcycle trailer but of the many different uses for a motorcycle trailer, How many times have I thought of how cool it would be to take Blitz ( a German Shepherd ) on a motorcycle ride with me. A grown German Shepherd Dog isn’t the easiest dog to put on 2 wheels. That’s where the option of motorcycle trailers comes in. Let Fido join you on your highway touring trips. Share the joy of enjoying the open wind and road with your dog in a pet trailer. Speaking from first hand experience, a trip is much more enjoyable when you have the company of your dog. Especially when it comes to motorcycle camping, there’s something reassuring about having man’s best friend out in the wilderness with you. With so many different options and uses available for motorcycle trailers, it’s easy to see the convenience they can bring for the dedicated motorcycle rider. Now, you have good reason to purchase motorcycle trailers. The last thing you need to worry about is what type of trailer to choose. There are many different types of trailers available, from cargo trailers, to camping and pet trailers. Enjoy the added storage for your motorcycle and ride in peace with all your gear and accessories. There are many trailers available for all types of budgets, if you don’t think one is within your budget. There is a great used market available for these as well. If a trailer isn’t your cup of tea, there are always other options like saddlebags, sissy bar bags, and even side cars for your companions. Most of all, don’t forget to enjoy the ride. If it doesn’t make you happy… you know the rest.